Major Appliance Repair - Fridge, Dishwasher, Dryer, Washer | All Appliance Service Co.
Our service techs are trained in a variety of different repair methods covering all sorts of different major appliances. We can fix any major appliance in your home and get it working in no time! Schedule a repair with one of our service technicians to get all of your appliances back in working condition or just schedule a maintenance call to help improve the longevity of your appliances. 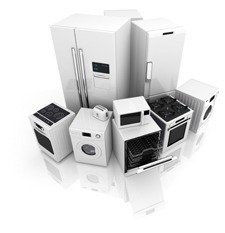 If you are in need of major appliance repair, All Appliance Service Co. is here to help. We service and repair all major appliances and major manufacturers. Call us today and schedule an appointment for one of our service technicians to come out and provide you with a diagnosis and consultation on your repair job! We offer fast, affordable, high-quality experiences with every repair!